When Ronald Reagan told us that if something moves, politicians want to tax it, and if it keeps moving, they want to regulate it, he was issuing a warning, not providing a how-to manual for government. Yet lawmakers and bureaucrats behave as if that’s what it was. No current event better illustrates this in California than the rush to crack down on dockless e-scooters. Motorized scooters, primarily Bird, Lime and Spin, are quickly becoming a part of urban landscapes. Rented via smartphone apps, riders pick them up and drop them off anywhere they please. Though they might look like toys, e-scooters aren’t frivolous. They provide riders with a fun and convenient mode of transportation and hold great value to the startups and investors behind them. Both are counting on the free market to create wealth. Of course, such delightful freedoms bring out the worst in politicians. Beverly Hills and West Hollywood have simply banned them. In San Francisco, home of Lime, which is valued at $1 billion, City Attorney Dennis Herrera has issued cease-and-desist letters to all three companies. His charges: The e-scooters are “unpermitted,” have created a “public nuisance,” and endanger “public health and safety.” Eventually some were impounded by the city. Santa Monica has filed criminal charges against Bird, which is based in the city and is valued at $1 billion on its way to $2 billion. The city accuses the company of operating without its permission and says it owes more than $6,000 in fines, according to Curbed Los Angeles. If San Francisco and Los Angeles were truly concerned about nuisances, and public health and safety, each would have made resolving homelessness a priority before the problem exploded into the human health hazard it has become. Standing in contrast is San Diego. Though police are citing some riders for not wearing helmets and cruising the sidewalks, the city is largely standing on the sidelines — for now. Local officials are letting the good times and dollars whiz by without trying to take both down hard. E-scooters were the unexpected celebrities of July’s Comic-Con. Lime said that more than 10,000 unique riders rode one during this year’s event. But that doesn’t mean the entire city is fully ready for them. 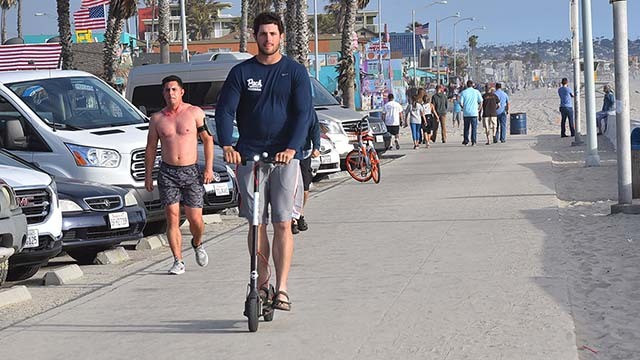 They were almost banned from the Mission Beach Boardwalk, an idea Faulconer supported, but the prohibition was rejected by the City Council in late May because it was seen as a “knee-jerk” reaction. Cities have the discretion to set reasonable safety rules for their streets and sidewalks. Few would object if they adopted local versions of Assembly Bill 2989. Sacramento’s attempt to legislate e-scooters is simply a list of safety guidelines like those governing electric bicycles. It’s unfortunate that San Diego is alone at the moment in understanding the economic possibilities of the e-scooter industry.